Behind 33 saves from goalie Matt O’Connor and senior Matt Ronan’s (photo) first career goal, Terriers battled #7 Lowell to a 2-2 OT tie at Agganis Arena. O’Connor matched River Hawks goalie Connor Hellebuyck, who leads Division 1 in goals against average, save-for-save. The sophomore netminder from Toronto stopped all 20 shots he faced in the second and third stanzas and overtime. The visitors opened the scoring midway through the first period when Derek Arnold converted a goal-mouth pass, but six minutes later Cason Hohmann took an indirect pass from Ahti Oksanen and ripped a wrist shot top corner past Hellebuyck for the equalizer. Lowell went ahead again late in the period when Josh Holmstrom jammed home a rebound with the River Hawks enjoying a two-man advantange. BU knotted the score again early in the middle period when freshman Brendan Collier won a battle behind the Lowell net and centered a pass to Ronan who fired it home. Terrier had numerous scoring opportunities in the third period and dominated the five-minute overtime, but couldn’t the Lowell netminder a third time. 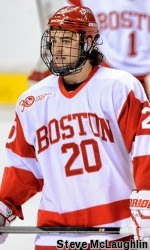 ►Ronan's brother Dan Ronan was a Terrier defenseman in the late 1990s. His cousin Ed Ronan played on BU's 1990 and 1991 Final Four Teams and later on the Montreal Canadian's Stanley Cup Champions in 1993. 2015 recruit Charles McAvoy scored the game-winner Team USA in its 4-2 victory against Finland the U17 Five Nations Tournament in Kovland, Sweden. The right-shot defenseman from Long Beach, N.Y., has five goals (along with six assists), second most among the U17s’ blueliners. 2014 recruit Jack Eichel was on the score sheet again with an assist in Team USA’s 4-2 win against Sweden in the U18 Five Nations Tournament in Dmitrov, Russia. The right-shot center from Chelmsford, Mass., has a 25-27-52 line in 32 U18 games, tops in goal-scoring and second in points for the team. Former Terrier co-captain John McCarthy scored his first goal of his NHL season in the Sharks 3-2 win over the Blackhawks. Matt Nieto was out of the San Jose lineup with a lower-body injury. Former BU All-American John Curry stopped 32 of 35 shot for Iowa as the Wild edged Chicago, 4-3 in overtime. Since his call-up to the AHL, the 2007 Hockey East Player of the Year has a 5-2 record with a 1.79 GAA and a .946 save percentage. Ryan Whitney scored his fourth goal of the season on a power play and Matt Gilroy added an assist for San Antonio as the Rampage defeated Lake Erie, 4-1. Terriers host New Hampshire in a 3 p.m. start at Walter Brown Arena today. 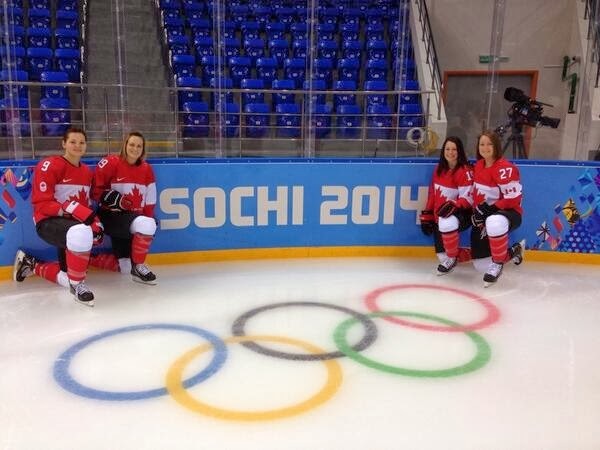 Four Terriers are in action today with Team Canada in its opening Olympic game in Sochi: Marie-Philip Poulin and ex-BU players Catherine Ward, Jenn Wakefield, and Tara Watchorn.